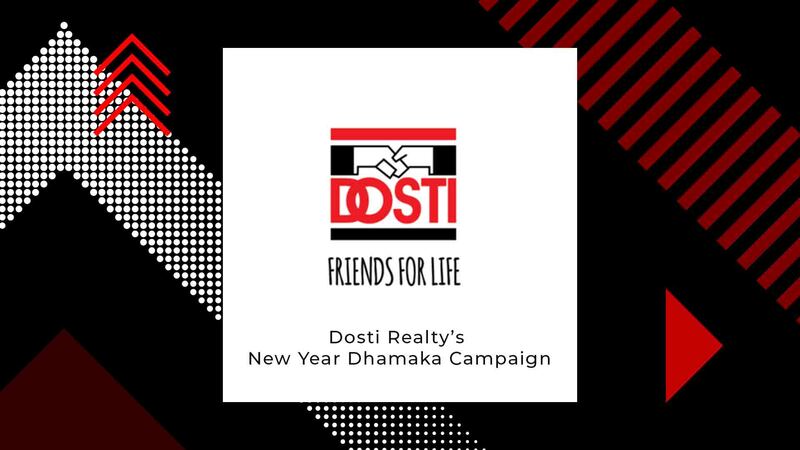 Dosti Realty, a premium real estate player known to deliver plush homes par excellence and design has announced an ideal ‘Dosti New Year Dhamaka 2019’ campaign. Setting the tone for a prosperous 2019 for its discerning buyers the offers facilitate a speedy and lucrative purchase decision potential investors and end-users to make better real estate decisions in the New-year. This initiative by the brand has been created to bestow value proposition to its significant customers, thus enhancing their property purchase experience. The campaign which commences from 17th January 2019 till 25th February 2019 has a host of enticing offers that vary for each project and will be divided into two phases. Phase I which is from 17th January – 4th February 2019 will have the maximum offer for those willing to leap at this fabulous opportunity. Phase II which is from 5th February – 25th February 2019 will have a reduced number of benefits. Through this campaign, Dosti Realty offers its buyers with special schemes to avail alluring advantages and excellent investment opportunities. The wide range of deals will facilitate buyers to own their dream abode at unbelievable prices with added benefits. The Dosti Dhamaka offer is designed to cater to potential buyers and investors who can capitalize on the attractive prices and offers in their projects namely – Dosti Majesta, Dosti Desire – Dosti Pearl and Dosti West County located in Thane (W) and their newly launched projects Dosti Belleza at Parel as well as Dosti Planet North in Shil Thane. For the recently launched premium residential tower Dosti Belleza in Parel, Mumbai which showcases spacious and luxurious 2 & 3 BHK apartments and is already 14 slabs up. The offer includes 1-year free rental from the date of booking, free AC’s and a modular kitchen. The ready possession 4 BHK luxurious apartments at Dosti Majesta at Ghodbhunder Road, Thane (W) has an unbelievable opportunity wherein you pay the same price for the floor of your choice. Besides this, the customer will get free AC’s and a modular kitchen in their new abode. Dosti Desire – Dosti Pearl located off Ghodbunder Road, Thane (W) and Dosti West County located at Balkum, Thane (W) have an array of 2 and 3 BHK apartments of varying sizes so a customer has multiple options to choose to best suit their needs besides the host of amenities the projects offers. The added Dhamaka is the fact that customers will get a stamp duty and registration waiver plus 1 year free rental from the date of booking. After the successful completion of Planet North – Phase 1 where Dosti Realty already delivered over 1000 homes, it recently launched Dosti Planet North – Phase 2 – Dosti Jade at Shil Thane. This project will also be a part of the Dhamaka benefit and has a stamp duty waiver offer. A wheel of fortune will also be spun by customers when they book a home during this period. This will entitle them a flat discount on the agreement value of the apartment they have booked. However, this special benefit is only reserved for the first few bookings.